For the remainder of January, they will be appearing on the 10, 14, 15, 19, 21, 22, 24, 27, and 30. In February, they will be swinging out on the 3, 5, 8, 11, 12, 14, 17, 22, 24, 25, 26, 28. 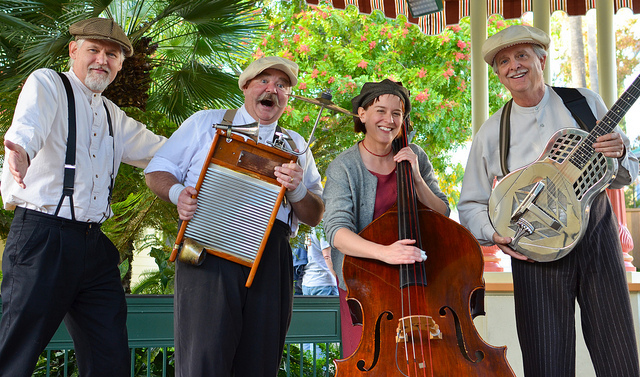 Founder Walt had a real love for hot jazz and it looks as if the tradition is being carried on in the best way. 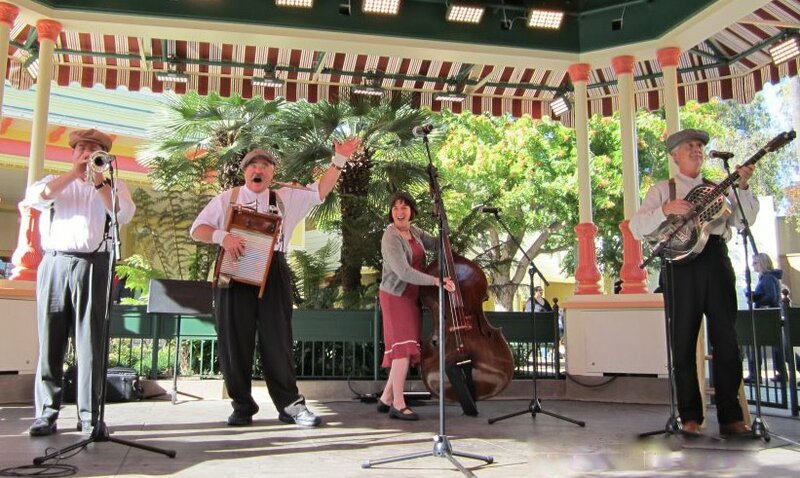 I want the great Disney marketing machinery to kick in — souvenir washboards would be the first step . . .
And here’s another photo — by Alex Matthews — that shows Bryan Shaw sitting in for Marc Caparone . . . same hot music and high-level entertainment! Jazz Lives on the Left Coast, too. I have no idea how many of your subscribers live in Southern California and hereabouts; I can only humbly ask that you consider sending out a notice (attached) about an upcoming event sponsored by JazzAmerica. We’re a 501(c)(3) non-profit corporation co-founded by Los Angeles by jazz legend Buddy Collette. Since our inception in 1994, we have provided continuous jazz instruction to hundreds of middle- and high-school students, and it’s always tuition-free.from the early teens. On November 23 – sandwiched between nights of the Pharoah Sanders Quartet – we will take over LA’s top jazz venue, Catalina Bar & Grill, for a jazz brunch. We’ll open with the Fairfax high school Young Lions, a fledgling jazz band comprised mostly of members of that school’s marching band. The Fairfax Lions marched their way to top honors in statewide competition last year. We’re sharing with them information, recordings and charts that reflect the transition between marching music and early jazz. In that vein, their opening number is a Victor Goines arrangement of “Second Line,” a traditional sound from New Orleans. Then they’ll play W.C. Handy’s “Beale Street Blues,” James P. Johnson’s “Victory Stride,” and make their way through the big band era, early Herbie Hancock and Stevie Wonder. Following the Young Lions will be String Fever, a new ensemble consisting of classically-trained cellists, violinists and violists. We’re exploring the sophisticated harmonic subtleties of Oliver Nelson’s “Stolen Moments,” some Ellingtonia (“It Don’t Mean a Thing…” and “Caravan,”) plus some original material provided by the eclectic Turtle Island String Quartet. 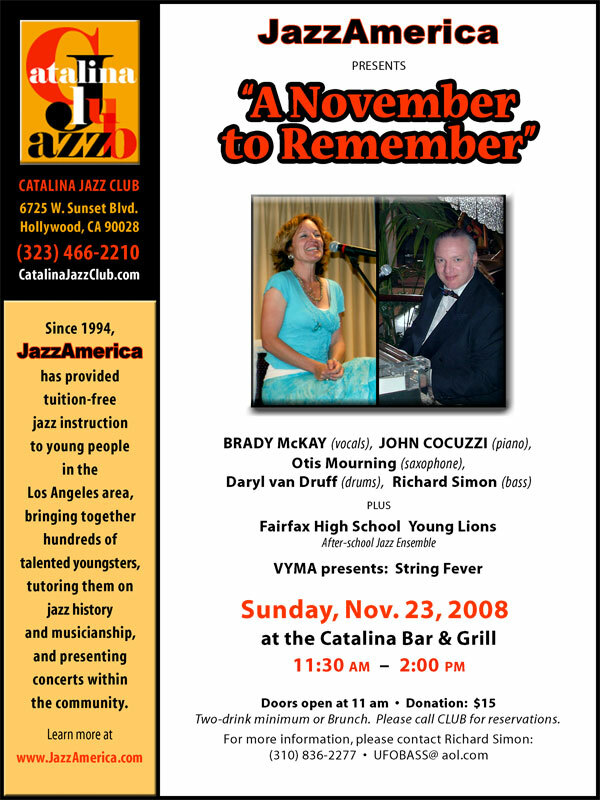 Closing the show will be some traditional/swing performers based in Sacramento, CA: vocalist Brady McKay,pianist/vibist John Cocuzzi, reedman Otis Mourning and drummer Daryl von Druff. Why should your readers know about this, especially if they aren’t local? Maybe it will spawn some interest in generating jazz instruction for youngsters where it doesn’t already exist. Before we knew the outcome of the recent election, we took a chance and billed the event as “A November to Remember.” With the sea change of last Tuesday, there’s an added gravitas to the banner. Candidate Obama was asked what appealed to him so much about playing basketball. He compared it to the improvisational essence and collaborative excitement of jazz. Imagine the possibilities of inspired young people turning to music to experience that same adrenaline rush. At JazzAmerica, we think it’s a slam-dunk. P.S. from the East Coast “Jazz Lives” person: When I first read this letter, I was enthusiastic about the enterprise. Anything that helps children become jazz musicians or even exposes them to jazz is, no question, valid and valuable. Then I remembered that Richard Simon is an ace jazz bassist himself, who played splendidly on Eddie Erickson’s CD, IT’S A GREAT FEELING. Any friend of Eddie Erickson is a friend of mine!